I'm absolutely thrilled to have Melissa from Melly Sews and Blank Slate Patterns on the blog today! 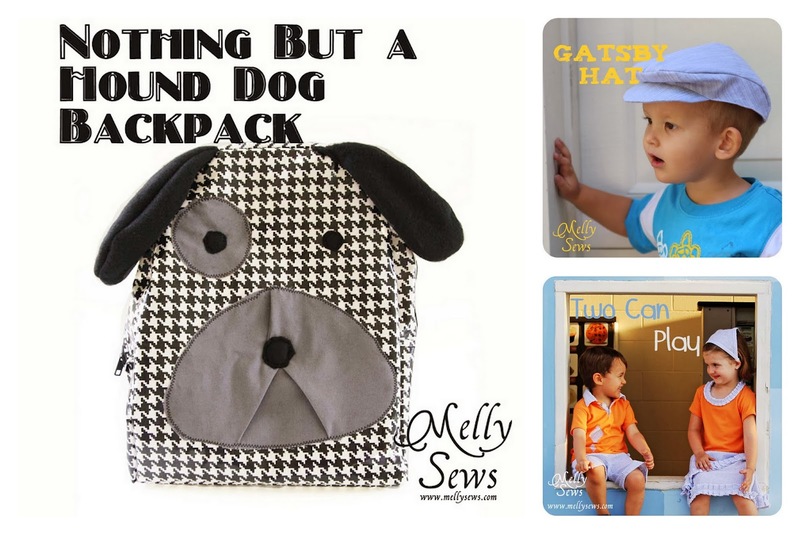 Melissa is one of the most generous bloggers in blogland and shares so much of her talent. 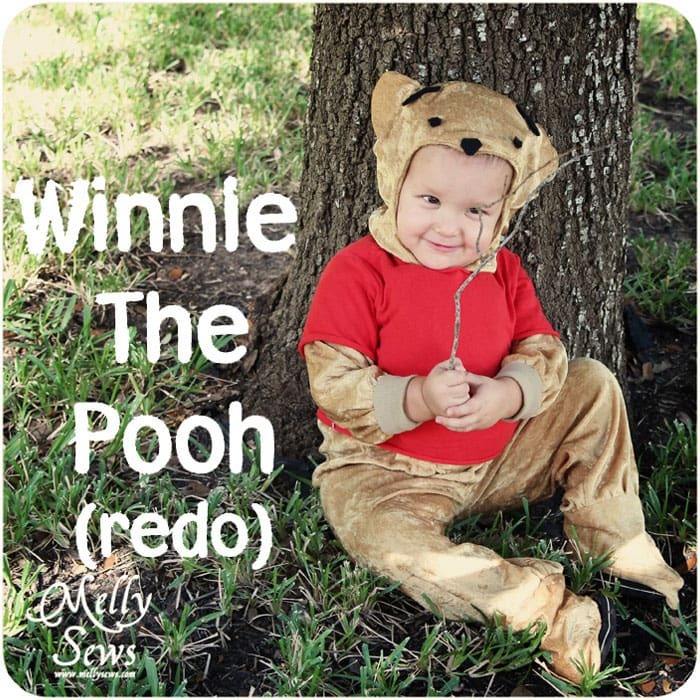 Today she's on the blog sharing a rundown of the DIY costumes she's made in the past. And don't forget to stop by Feather's Flights and see the Girl's DIY Costume Round up at Sewistry. Hi Make it Handmade Readers! I'm Melissa from Melly Sews, and as a former theatre teacher I am super excited to be here talking about Halloween. I love doing the costumes, as you can imagine with my theatre background - in fact the costume shop is where I learned to draft and grade patterns. So today I'm going to take you through a review of Halloween past (imagine me, the silent ghost from A Christmas Carol. Or is that too much mixing of holiday metaphors?) with some tutorials for inspiration, and let you in on my plans for this Halloween. 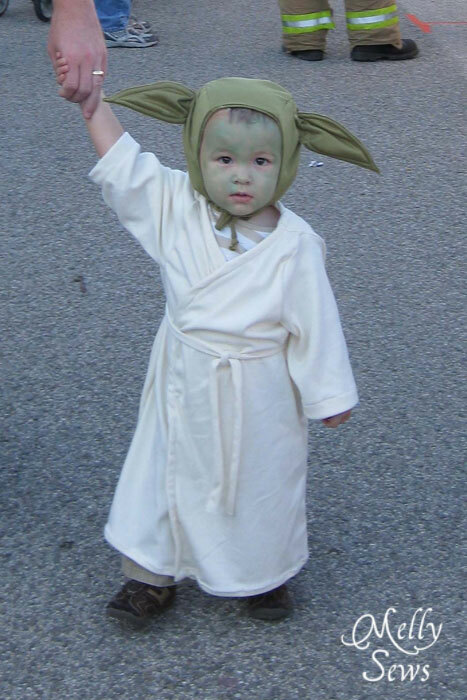 For Tater's first Handmade Halloween, at 19 months old, I made him a Yoda costume. Unfortunately this was before I started blogging, so I don't have a tutorial on how I did this. I can tell you that hat is a bonnet made of knit fabric that tied under his chin and I wired the ears so they would stand up. The original plan was for the hubs to be Hans Solo while I rocked some Princess Leia, but I was in the first trimester with Bean at that point and too sick to sew much besides my little Yoda. 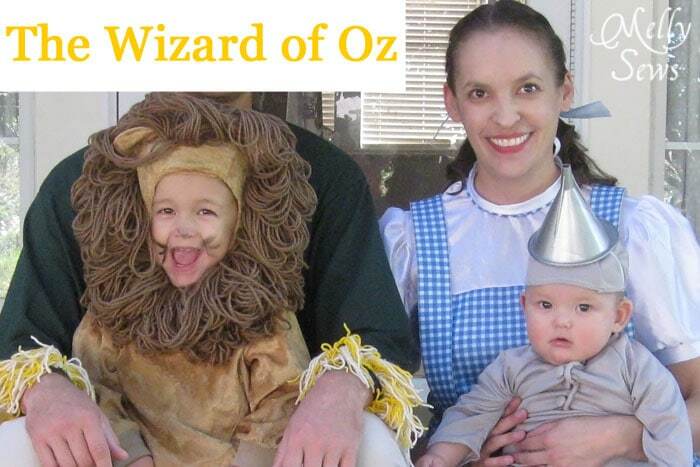 The next year I did pull off family costume, but the hubs says showing this picture of him on the internet is verboten. But don't the rest of us look cute? My costume was actually thrifted from a garage sale, and very poorly sewn, but hey, I didn't have to sew it. I had enough fun figuring out how to draft Bean's Tin Man sleeper. And the hat is a plastic oil funnel spray painted silver. Over a beanie since he had no hair. Tater's costume came from a Big 4 pattern - can't remember which. Once Bean was walking, I was blogging. 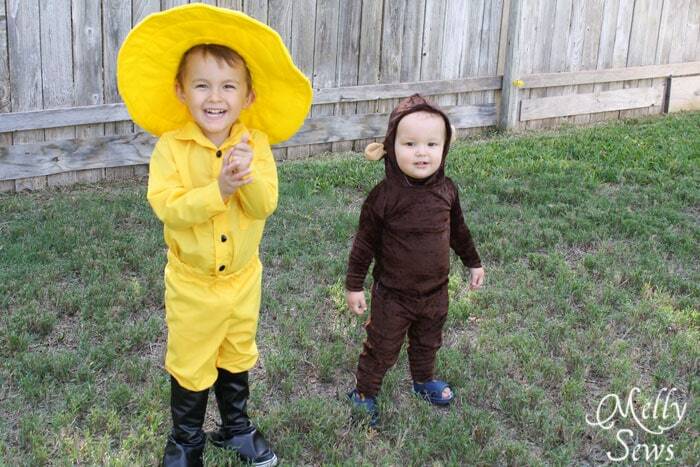 And so for his second Halloween we did Curious George! I have a Man in the Yellow Hat tutorial here for the hat. The shirt is an O+S Sketchbook Shirt, and the pants were self drafted. Bean's monkey suit is basically leggings and a t-shirt with a tight hood made out of stretch velvet. With felt ears sewn in. Recognize this costume? It's an upcycle of Tater's Lion costume when he was 2. For Bean I showed how I turned it from Lion to Pooh here. Why wear it just once, right? Tater got a jumpsuit and another hood to be Tigger. 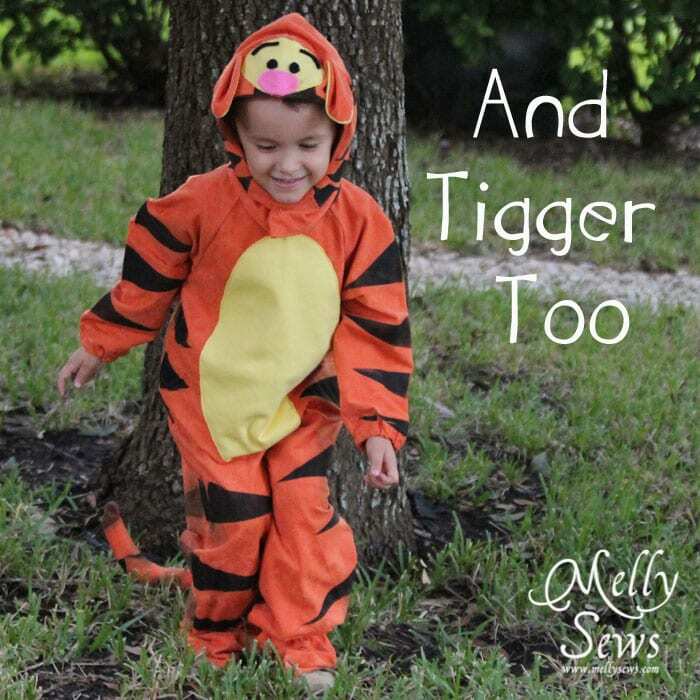 Find out how Tigger got his stripes here. 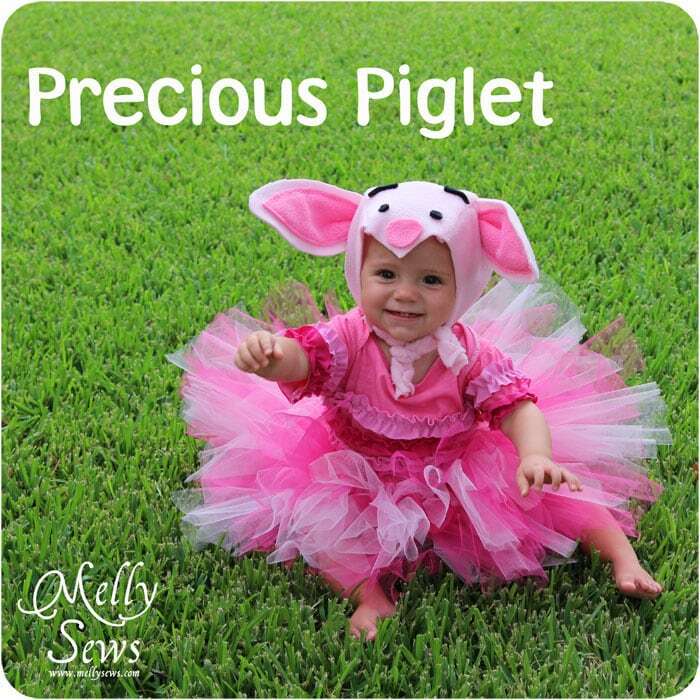 And since my niece Baby Girl was old enough for Handmade Halloween by last year, she got to be Piglet. I have a tutorial for the ruffled onesie and a free pattern for the hat here. Which, incidentally, could be used to make a Yoda hat. Or a Curious George hood. Or Tigger or Pooh. And what am I planning this year? Well, due to Tater checking out Star Wars books from the library, I think we've come full circle. 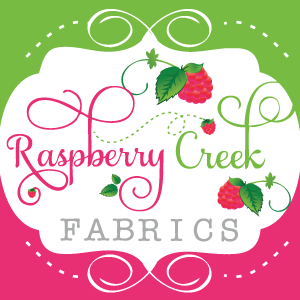 You can visit my blog this month to watch as I create Luke Skywalker, Hans Solo and Princess Leia costumes. I'm pretty sure there are going to be some Blank Slate Patterns involved in this - definitely the Cool Cardigan, the Clean Slate Pants and the Hipster Henley. Thank you so much Melly-- I just love seeing all the coordinated costumes. I'm sure you all are already familiar with her, but I wanted to highlight some of her older projects that I just love. Thanks for stopping by! See you back here tomorrow for more Halloween inspiration!